It’s day 13 aboard the Henry B. Bigelow and we have made the turn at our southern stations off the coast of North Carolina and are working our way back to port at some of our inshore stations off the coast of Maryland. You may wonder how each of the stations we sample at sea are chosen? 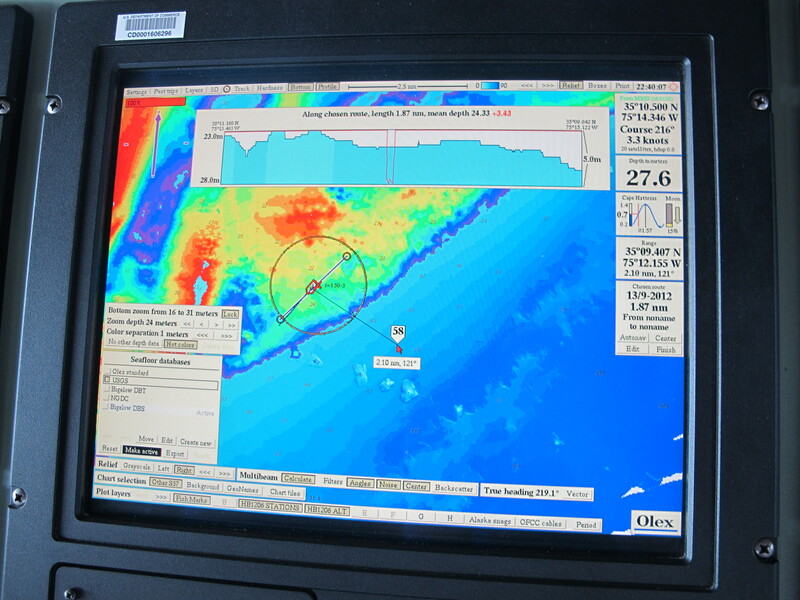 The large area of Cape May to Cape Hatteras are broken into geographic zones that the computer will assign a set amount of stations to, marking them with geographic coordinates. The computer picks a set number of stations within each designated area so all the stations don’t end up all being within a mile of each other. Allowing the computer system to pick the points removes human bias and truly keeps the sampling random. The vessel enters the geographic coordinates of the stations into a chartplotting program in the computer, and uses GPS, the Global Positioning System to navigate to them. The GPS points are also logged on a nautical chart by the Captain and mate so that they have a paper as well as an electronic copy of everywhere the ship has been. You may wonder, how does the captain and fishermen know what the bottom looks like when they get to a new point? How do they know its OK to deploy the net? Great question. 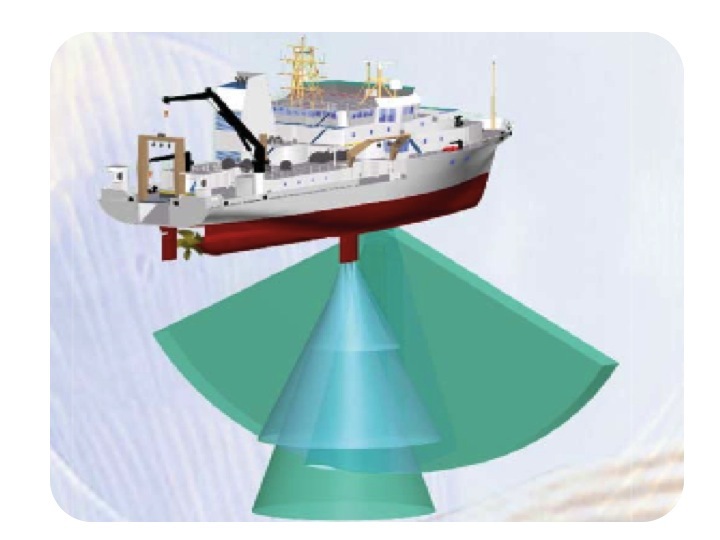 The Henry B. Bigelow is outfitted with a multibeam sonar system that maps the ocean floor. Some of you reading this blog might remember talking about bathymetry this summer. This is exactly what the Bigelow is doing, looking at the ocean floor bathymetry. By sending out multiple pings the ship can accurately map an area 2.5-3 times as large as its depth. So if the ship is in 20 meters of water it can make an accurate map of a 60 meter swath beneath the boats track. The sonar works by knowing the speed of sound in water and the angle and time that the beam is received back to the pinger . There are a number of things that have to be corrected for as the boat is always in motion. As the ship moves through the water however, you can see the projection of the bathymetry on their screen below up in the wheelhouse. These images help the captain and the fisherman avoid any hazards that would cause the net or the ship any harm. A good comparison to the boats multibeam sonar, is a dolphins ability to use echolocation. Dolphins send their own “pings” or in this case “echos” and can tell the location and the size of the prey based on the angle and time delay of receiving them back. One of the main differences in this case is a dolphin has two ears that will receive and the boat just has one “receiver”. Instead of finding prey and sizing them like dolphins, the ship is using a similar strategy to survey what the bottom of the sea floor looks like! The last few days I have been trying my hand at removing otoliths from different species of fish. The otoliths are the ear bones of the fish. Just like the corals we have been studying in Bermuda, they are made up of calcium carbonate crystals. They are located in the head of the bony fish that we are analyzing on the cruise. 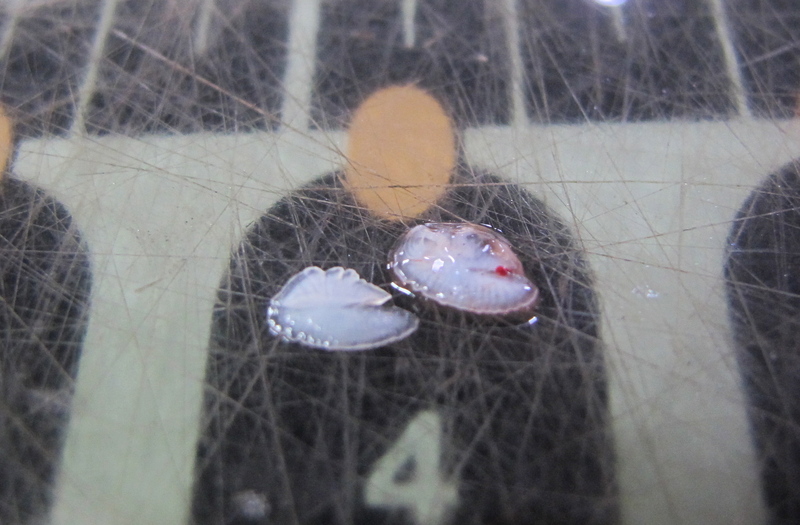 A fish uses these otoliths for their balance, detection of sound and their ability to orient in the water column. If you remember, at BIOS, we talk a lot about the precipitation of calcium carbonate in corals and how this animal deposits bands of skeleton as they grow. This is similar in bony fish ear bones, as they grow, they lay down crystalized layers of calcium carbonate. Fisheries biologist use these patterns on the otolith to tell them about the age of the fish. This is similar to the way coral biologists age corals. I have been lucky enough to meet and learn from scientists who work specifically with age and growth at the Northeast Fisheries Science Center Fishery Biology Program. They have been teaching about aging fish by their ear bones. These scientist use a microscope with reflected light to determine the age of the fish by looking at the whole bone or making slices of parts of the bone depending on what species it is. This data, along with lengths we have been recording, contribute to an age-length key. The key allows biologists to track year classes of the different species within a specific population of fish. These guys process over 90,000 otoliths a year! whew! The information collected by this program is an important part of the equation because by knowing the year class biologists can understand the structure of the population for the stock assessment. The Fishery Biology program is able to send their aging and length data over to the Population Dynamics Branch where the data are used in modeling. The models, fed by the data from the otoliths and length data, help managers forecast what fisheries stocks will do. It is a manager’s job to the take these predictions and try to balance healthy fish stocks and the demands of both commercial and recreational fishing. These are predictive models, as no model can foresee some of the things that any given fish population might face any given year (ie food scarcity, disease etc. ), but they are an effective tool in using the science to help aid managers in making informed decision on the status of different fish stocks. To learn more about aging fish please visit here. You can see here an otolith that is 1+ years old. It was caught in September and that big 1st band is its Year 0. You can see that the black dot demarks the fish turning 1. You can then see the Summer growth but not yet the winter growth. This fish has not yet turned 2, but it will be Jan 1st of the next year. I have to end with a critter photo! This is a Cobia (Rachycentron canadum). 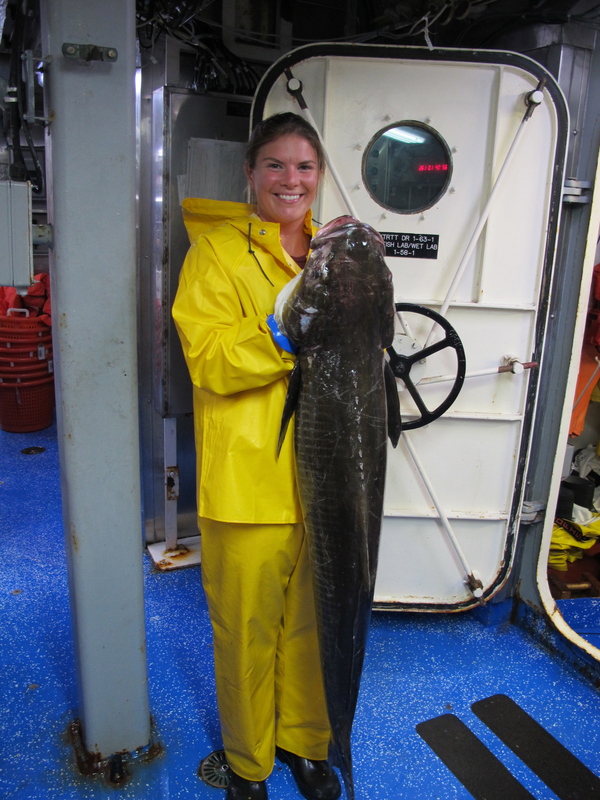 This entry was posted in 2012, Kaitlin Baird 2012, NOAA, NOAA Fisheries Service, NOAA Teacher at Sea and tagged bathymetry, Cobia, ear bones, echolocation, Fishery Biology program, GPS, Henry B. Bigelow, Kaitlin Baird 2012, multibeam sonar, NOAA, Northeast Fisheries Science Center, otolith, sound in water. Bookmark the permalink.